Frequently, especially around Christmas, you can buy inexpensive decorative brass horns. Usually the mouth piece shape makes it hard to actually play them like s trumpet. But they can be turned into kazoos, so you can acompany your favorite carols. One way to do that is shown to the left another way is below. You can also just cover the mouth piece with a piece of membrane, either by covering it completely and secure it with a rubberband around the neck of the horn, or by glueing a piece of membrane across the top of the mouth piece with rubber cement. With your mouth somewhat open, touch the edges of the mouth piece to your lips, so there is room for some of the air to escape. Hum or sing a tune. 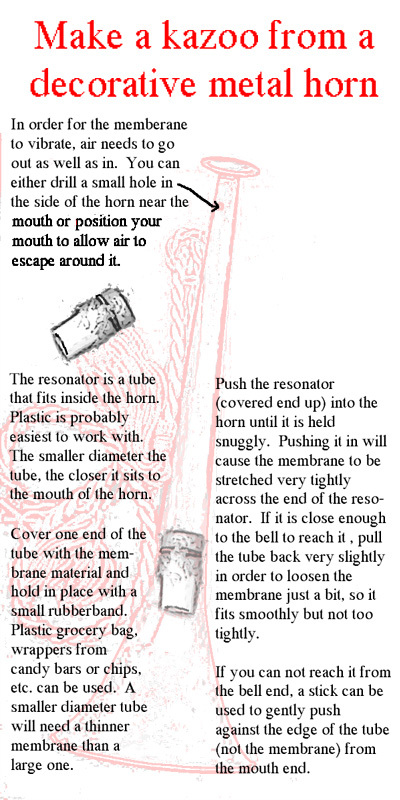 You may have to adjust the membrane and experiment with mouth placement to find the way to get a good sound.